Meredith Horton stood in for Jack who is returning Samantha to school and asked Betty to update the Club on the upcoming Roger’s Ride. Betty Ballantyne said we have sold 1/3 of the raffle tickets for a 2-night stay at any one of the four Inns at Mill Falls, and with 13 days until the ride, the membership really needs to push the tickets. It is still early for a lot of rider registrations, but we have six early registrants. Betty shared the many details, asked for max effort by Club members that day, asked for baked goods for dessert, and again, push those raffle tickets. A final pre-ride committee meeting is scheduled for Monday, August 18th, 5:30 PM at Irwin Motors. 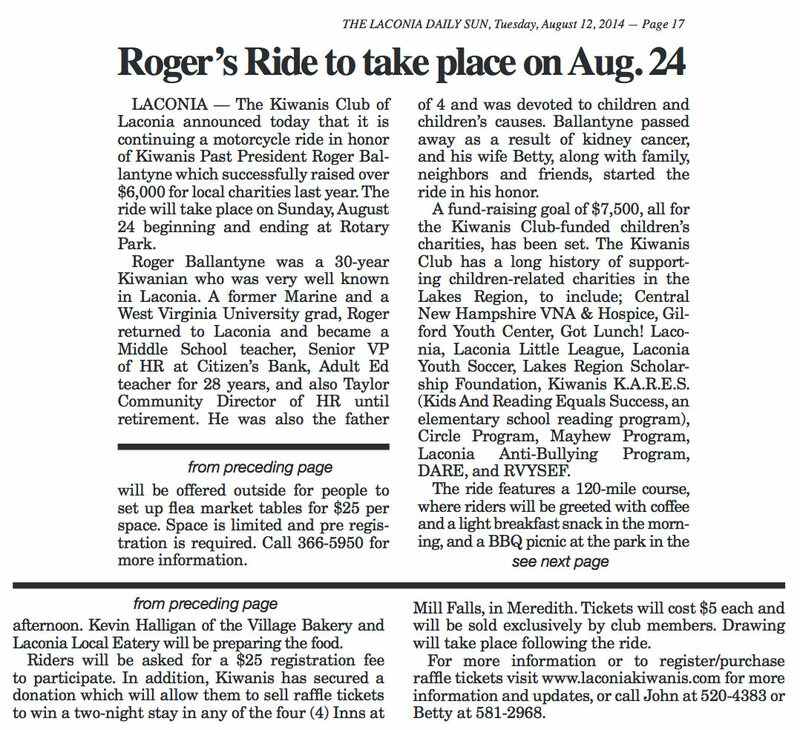 For more details on Roger's Ride, “click” here. 50 50: None this week. The Sergeant-At-Arms, despite promising a firm hand beginning tonight, refused to fine the driver of an immaculate, classic 1965 Corvette parked on the lawn. It was a beaut. Tonight’s guest speakers were Misa, Maria and Brenda, the three advance team members from Up With People. They are in Laconia until the remainder of the 100-person group arrives for a September 1-8 Laconia stay. Up With People is a partner with Kiwanis International. In 2015 Up With People will be celebrating their 50th anniversary while Kiwanis International is celebrating their 100th anniversary. The advance team is in town to set up additional donors and also to find host families for the 100 performers. Misa said being a host is eye-opening for all families and a wonderful treat for the performers as well. Requirements to host is breakfast, limited transportation, and dinner. Jim Fortier shared that he has hosted twice and loved it. Two 2-hour shows will be held at the Middle School Friday September 5th, and Saturday September 6th. While in the community they focus on community service and heightening awareness of the world around us. If anyone can support scholarships for local kids to attend the show, please let them know. For more information on Up With People, “click” here. Tonight's meeting was adjourned at 7:35 p.m. It is with the deepest regret to report on the passing Paul Normandin. To read a celebration of Paul's life, "click" here.